On Black Friday, I was able to get an Omega Pro 10049 boar brush. Compared to my Omega synthetic and my best badger, its bristles looked "tough" and seemed stiff when dry. But every time I shave with it, it seems to be a lather monster and feels wonderful on my face! Yet after rinsing it out and letting it dry, it once again has that disheveled, prickly look to it. Maybe it is just trying to psych me out! In any event, I really am digging it! (12-26-2015, 09:54 PM)MaineYooper Wrote: On Black Friday, I was able to get an Omega Pro 10049 boar brush. Compared to my Omega synthetic and my best badger, its bristles looked "tough" and seemed stiff when dry. But every time I shave with it, it seems to be a lather monster and feels wonderful on my face! Yet after rinsing it out and letting it dry, it once again has that disheveled, prickly look to it. Maybe it is just trying to psych me out! In any event, I really am digging it! Eric, I have had a 10049 for years and it is a fabulous brush. That inexpensive brush beats my Shavemac 177 silvertip, hands down. A fancy expensive handle is nice but it is the working end that is most important to me. I love the big professional boar brushes. Make sure you soak it before each use. You'll be amazed how it feels after it breaks it. I have been vindicated! I to believe the knot is the most important part of the brush. A nice handle is just that, and trust me, I own many brushes with beautiful handles. But to me, without a great knot, they mean nothing. It is funny, I started a thread elsewhere about this and I was surprised how the fanboys of these or that brand would say the handle was more important. Granted, to each it's own, but if you are a serious wet shaver, there's is no way in this green earth, the knot is of no importance in the performance of the brush. I have been vindicated! I too believe the knot is the most important part of the brush. A nice handle is just that, and trust me, I own many brushes with beautiful handles. But to me, without a great knot, they mean nothing. Granted, to each it's own, but if you are a serious wet shaver, there's is no way in this green earth the knot is of no importance in the performance of the brush. IMo boars are the best value for you money out there and they only get better with age. (12-27-2015, 04:37 AM)hrfdez Wrote: I have been vindicated! I too believe the knot is the most important part of the brush. A nice handle is just that, and trust me, I own many brushes with beautiful handles. But to me, without a great knot, they mean nothing. I do believe that the handle is important. Both ergonomics as well as how pleasing it looks and to hold. Granted, the quality of the knot is more important, but if you decide you want this a your daily driver, you may want to find someone who will transplant it into a nicer handle--or find a nicer handled boar : ). I really have come to appreciate boar brushes. They do a great job and the price makes them accessible to all wet shavers. This is my stable so far and each one is fantastic in their own way. I also have a very good synthetic and a great horse hair but they are not quite for me atm. In the future I do plan on getting a nice badger just to see how they compare. 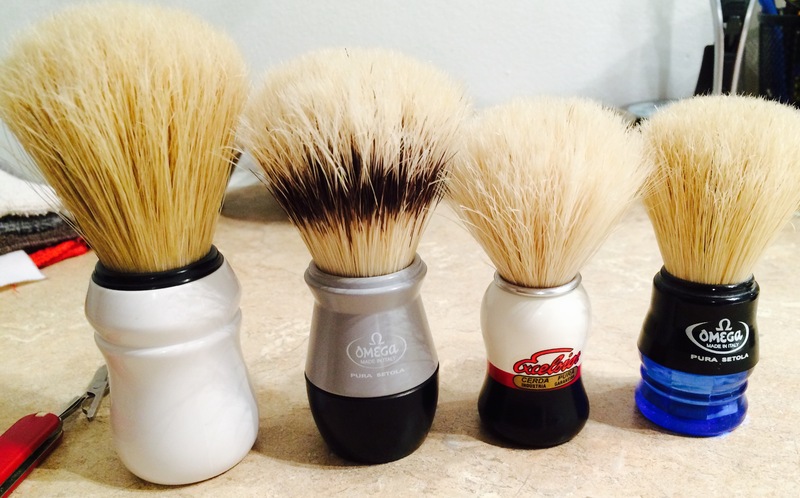 My four boars cost me just shy of 35 dollars, all bought new, and I really doubt there is a better price to value ratio than boars when it comes to shave brushes. (12-27-2015, 04:12 PM)willc Wrote: I really have come to appreciate boar brushes. They do a great job and the price makes them accessible to all wet shavers. That is really something! That is about what my entry level badger from Amazon cost! I plan to use my boar all this week, on my different soaps, to see how it goes.